Whit wey can we revive the Scots leid? Norway is in some regards at least 150 years ahead of Scotland: Until the mid-19th century Norwegians wrote standard Danish, although they spoke Norwegian dialects or at the very least Danish with a strong Norwegian accent; however, for political reasons they decided to recreate a language of their own (they ended up with two separate written languages for good measure, but that’s a different story). In Scotland, there is still no standard way to write Scots, and many people have negative feelings towards the language. Here I’ll discuss two lessons Scots language standardisers can learn from Norwegian. Speak yer dialeck, write staundart Scots! “Speak dialect – write Nynorsk”. I sense that many Scots speakers feel that a written standard would be harmful to the Scots dialects. However, Nynorsk (the form of Norwegian that is closest to the dialects) proves this isn’t the case. 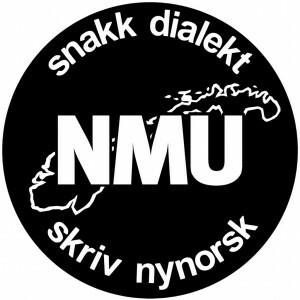 For years, a common slogan was “snakk dialekt – skriv nynorsk” (“speak dialect – write Nynorsk”), and my impression is that it’s been very successful. Norwegian television is certainly full of people speaking various dialects, and I’ve seen school books teaching how to understand them. There’s no reason whatsoever why the Scots language community couldn’t go down the same route. That is, it should be feasible to tell people to write standardised Scots while encouraging them to speak their local dialect. Main forms (lysbiletapparat and ljosbiletapparat) and side forms (lysbildeapparat and ljosbildeapparat). 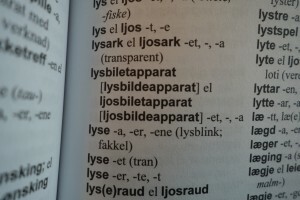 For many years, Norwegian dictionaries have been full of so-called “main forms” (hovedformer) and “side forms” (sideformer). (The proportion tends to go up and down over time, but that’s not important here.) Both types are correct, but in official contexts (such as in school books) only the main forms can be used. daurk or derk adj dark. This means that everybody has a free choice between writing daurk or derk. Dens [or Danish] adj Danish. This means that nobody would get a red mark for writing Danish instead of Dens (and spell-checkers would allow both), but school books and other official documents would always use Dens. bairn [or wean (W)] n child. whaur [or far (N) or whair (S)] adv where. If we learn these lessons from Norwegian, we can encourage both standard Scots and the Scots dialects while improving literacy in Scots and raising the status of the language. ← Where was the SNP? Thanks for this article. I taught at NTNU Trondheim (university) for a couple of years and used a mixture of English and Ryksmal (standard Norwegian) but the course exams had to be given in Ryksmal and optionally in Nynorsk. Once this option was requested (so I estimate one student out of the 80 I taught) and I was pointed to someone in the Department who could write Nynorsk which had a exact and uniform spelling. It was all sorted with light amusement but no negative feeling, typical of the uniformly tolerant educated company I kept. Note that Trondheim is not in the traditionally Nynorsk dialect areas, which are concentrated in the West, near Bergen, Alesund etc. so the student’s request had some rarity value. @malciechaluim @arcofprosperity interesting, but English is constantly evolving due cultural influences, currently USA. Hard to resist this.